Yesterday I told you about the Washington Winter Beer Festival, which is a primary funding mechanism for the Washington Brewers Guild. It occurs to me that many of you may not know what that means. Many of you may not understand why you should give a flying leap about the Guild. Here is why you should you feel good about buying tickets to the Winter Beer Festival. Nearly 300 breweries call Washington home and they’re out there right now making beer for you. Not just in Seattle, but in places like Ferndale, Waitsburg, Seaview, and Kettle Falls. You want to drink tasty, local beer? Washington’s breweries got your back. The purpose of the Guild is to build a community of brewers while advancing their common interests. What do I mean by “interests?” Well, I’m talking about laws and policies, taxes and regulations. The Guild works to make sure the Washington State Legislature and the Washington State Liquor Control Board don’t run roughshod over the state’s brewing industry. I promise you that, given the opportunity, the powers-that-be in Olympia would over-tax and over-regulate the craft beer industry to death. They’ve tried, but thankfully the Guild was there to disrupt their evil plans. 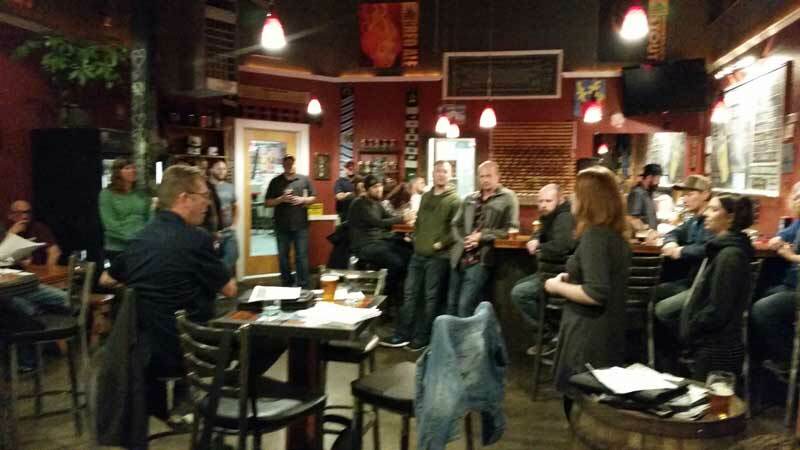 The Washington Brewers Guild roadshow event at Silver City Brewery in Bremerton. Even the largest Washington breweries qualify as small businesses. Usually, they are very small businesses and are often operated by notoriously laid-back, easy-going people. On top of that, it is a growth industry and is what many people view to be a “sin” industry. In other words, Washington’s craft breweries are an easy target without the Washington Brewers Guild providing a united front. From time to time, it is necessary for the Washington Brewers Guild to take a formal position on an issue. Before doing so, it solicits input from its members who have a wide variety of business models and ideologies. The Guild then distills that information down into a position that is the best for the overall brewing community of Washington. Right now, members of the Washington Brewers Guild executive committee are on a big roadtrip around the state, meeting with the local members, sharing information, and promoting a sense of community among Washington’s 297 breweries. They call it the Roadshow. On the itinerary, stops in Leavenworth, Spokane, the Tri-Cities, Vancouver, and Bremerton. The Roadshow stopped at Loowit Brewing in Vancouver last night. Membership in the Washington Brewers Guild is voluntary. Participating in Guild activities and serving on the executive committee is also voluntary. It is a noble endeavor performed by people who are passionate about seeing Washington’s brewing community thrive. Breweries are not required to join the Washington Brewers Guild, but the fee is nominal. Not all breweries are members, to be fair. I’d like to think most breweries are smart enough to recognize the value the Guild offers when it comes to fighting Olympia, if nothing else. I’d also like to think that most beer drinkers are smart enough to recognize the value of the Washington Brewers Guild. The Washington Winter Beer Festival is one of the Guild’s primary funding mechanisms. You can feel good about buying a ticket and supporting the cause. Whether you know it or not, if you love Washington Beer then you also love the Washington Brewers Guild. Do not confuse the Guild with the Commission. The Washington Beer Commission runs many of the other big beer festivals in Washington. Like Belgianfest, Washington Brewers Festival, and so on. The Commission is totally separate from the Guild. 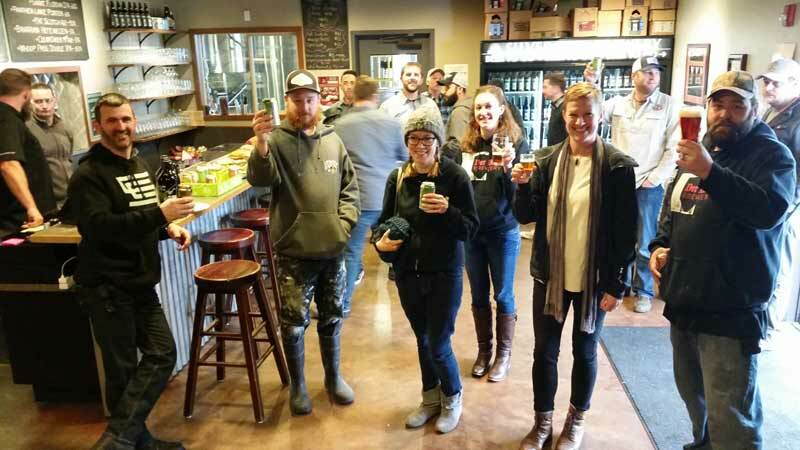 By law, the Commission is tasked with promoting Washington beer as a product and operates as part of the Washington State Department of Agriculture. It is about marketing, not about policy and law. In fact, the Commission is legally prohibited from engaging in political activity. The Guild and the Commission have some shared interests, to be sure, but are totally separate organizations. If I didn’t already (give a flying leap) I would now. Thanks.